This is a free printable quiz that is a little harder for the older kids. If they need help then let them look the bible verse up that is provided with it. Be sure to tell them the entire bible story behind the death and resurrection of Jesus so they can answer these questions. 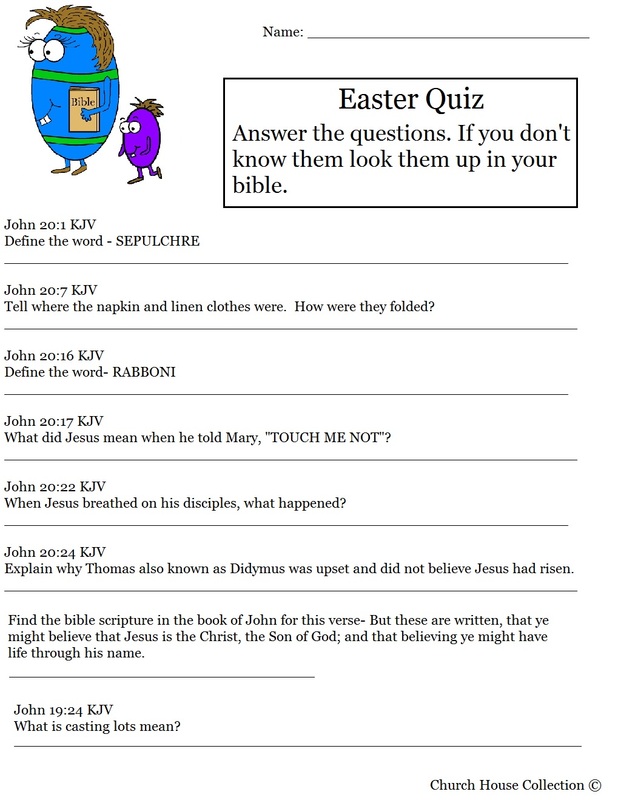 This goes along with the matching lesson plan "Easter Egg Bible Sunday School lesson". Find the bible scripture in the book of John for this verse- Bu these are written that ye might believe that Jesus is the Christ, the Son of God; and that believing, ye might have life through his name. Or rather, "embrace me not," or, "cling not to me,"
He was upset because Jesus showed up to the disciples when he was not there. He missed out. It means to gamble. casting lots - making a chance decision by using lots (straws or pebbles etc.) that are thrown or drawn.